In the past year, we came across a few chocking examples where large amounts of taxpayers’ money had been wasted by Westminster Council. We very well know that Westminster Council have always been very good at collecting money from the public (their ridiculous bike parking tax illustrates this very well), but the key question we are now asking ourselves is whether they have been spending all this money wisely. In other words, has the Council been serving the needs and wants of its residents, visitors and other stakeholders by spending their money adequately? * In March 2009, £15 million worth of taxpayers’ money was spent in a failed CCTV system, with cameras that were of too low a resolution (704 x 576 pixels) to meet the DfT’s Traffic Management Act. * £17 million worth of taxpayers’ money was put at risk by the Tory decision to invest in now-failed Icelandic Bank Landisbanki, even though the Council’s Treasury Management advisers (Sector) had said on 13th May 2008 that credit ratings agency Fitch had assigned a negative outlook to Landisbanki in terms of its long term A rating. * The same Westminster Council paid Steer Davies Gleave £12,140 to conduct an on-street survey to find out what motorists thought of the parking facilities in Westminster. 628 motorists were interviewed and the results were so desastrous that Councillor Chalkley decided to ignore the survey completely. This is what is being done with our money in Westminster! * Westminster Council spent more than £675,000 worth of taxpayers’ money to set up their Partnerships in Parking (PiP) scheme, which is now suspected to be illegal under European law. The scheme blatantly encourages other councils to adopt Verrus (the pay-by-phone parking system currently in use in Westminster), in exchange for a rather high fee, without going through the necessary tendering process, which may make the overall scheme completely illegal. In addition, the European Commission and the Office of Fair Trading are currently investigating the way in which the Verrus pay-by-phone parking system was implemented in Westminster, including the lack of tendering process conducted by the Council to give a fair chance to other organisations to present their products and services, in accordance with European law. 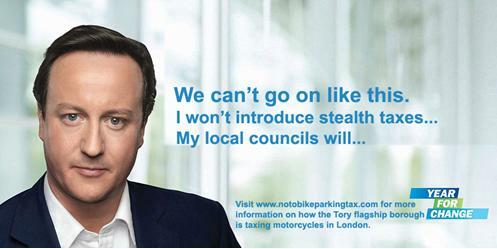 * At least £60,000 spent so far to replace and clean a high number of defaced motorcycle parking signs. A group of unknown individuals have decided to take radical action against the Council, following Councillor Chalkley’s most democratic decision to make his motorcycle parking tax permanent, despite the 3,000+ written objections that he received and the monthly protests organised by the No To Bike Parking Tax campaign attended by thousands of motorcyclists, bringing Central London to a standstill during rush hour. 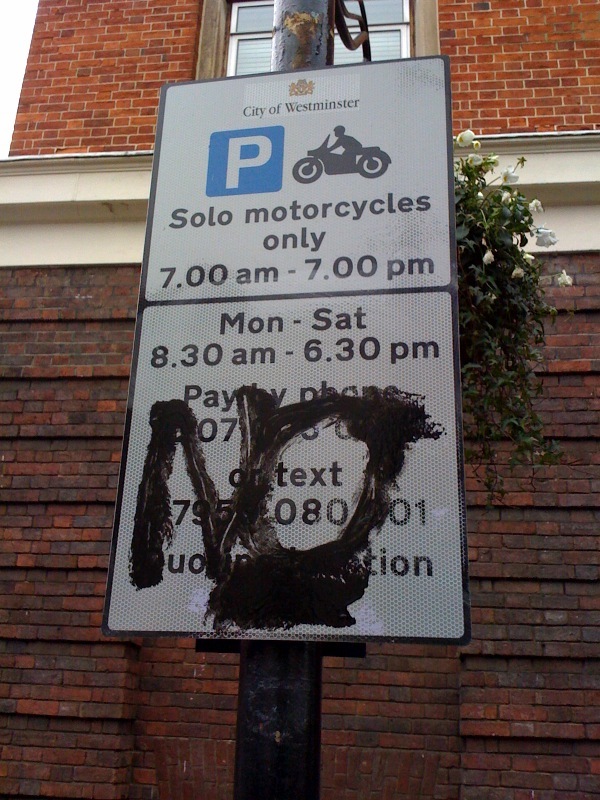 The important thing to note is that, had Councillor Chalkley listened to the public and scrapped his ridiculous motorcycle parking tax, the £60,000+ spent so far would have been spent on serving the Westminster community, as opposed to replacing and cleaning unwanted parking signs which, undoubtedly, will be defaced again, as they are replaced or cleaned. * More than £41,000 have recently been spent on the purchase of 200 security devices (ground anchors) for motorcycle parking. The problem is that those security devices are also in use in the neighbouring Borough of Kensington & Chelsea, where they have proved to be highly unpopular. Unsurprisingly, and as confirmed in a Freedom of Information request, Westminster Council failed to conduct any kind of consultation prior to purchasing the security devices. Since they have failed to listen to thousands of motorcyclists opposed to their bike parking tax, why would have they bothered asking them about those security devices, after all? Anyway, can you imagine how much money these Conservative bureaucrats are taking from the public on a daily basis to then be completely wasted due to their incompetence and lack of business sense? How surprising is it when the same Conservative bureaucrats decide to introduce stealth taxes, such as on motorcycle parking for instance, in order to recover their losses? When we heard that Councillor Chalkley’s parking department was heading towards a £10 million deficit, we understood why he was so desparate to impose his bike parking tax and encourage other councils to adopt it through the potentially illegal PiP scheme, no matter the thousands of objections he had received. I can’t believe they’ve wasted so much of our money. But it’s the reality. They keep saying that they haven’t increased council tax but what they don’t say is that they keep taxing everything else, including bikes, to compensate. I spent quite a few years in London and must say that I’m quite happy to have moved back to Paris where I can park my bike anywhere I like, on pavements, in secured bays etc… for FREE!!!! When I was in London, it was a nightmare to find a space in Westminster and I got my bike damaged 3 times in the parking bays. Good luck guys with your fight and please don’t export your tax over here! That is a lot of mistakes for 1 council ! Is this just the tip of the iceberg ? « Is Westminster Council getting short of bike parking signs?